For my Canadian friends out there, you may know of this website called RedFlagDeals. It's basically a message board where users can post up any hot sales or deals going on at the moment, in an effort to share the glory of saving money. Anyhow, last month someone posted up the deal that Dead Space along with a few other games (eg. Mass Effect, Lost Odyssey, etc.) were going on sale for $10 at Futureshop the coming Friday of that week. It was such a hot deal because regularly the game retails for $40, the game is only 8 months young and it was a well reviewed game. However, a deal so hot catches the eyes of a group of rabid shoppers that RFD boarders have dubbed "hoarders". The "hoarders" would latch on a deal and buy out a product in bulks. With gaming, because the deal is so low, they then can go to a store that does trade-ins (ie. EBgames, Blockbuster Video, etc. ), unload their spoils and reap in the profits through the higher return prices. The downside is that for people who actually want to purchase the game to play, it becomes a challenge of tracking down the game where it's available. So on midnight of the Friday sale, the hoarders were hard at work, clearing both online stock and store stock by "in-store-pick-up". That afternoon, I scoured Toronto for 3 hours looking for this game. I was hindered with two obstacles, a.) my parents took the car so I couldn't drive around easily to the various destinations, b.) I was relegated to using my sister's bus pass, but I had a time limit of 3 pm because she had to go to school in the afternoon. So I left my house at noon, and store after store, they were out of stock. Finally I was told at one of the Best Buy's that they still had tons of stock at the Best Buy in Scarborough. So it was a race against the clock. I had 45 minutes left and I estimated that if the bus came exactly when I got to the bus stop, I'd make it home right at 3 pm. Well, the bus didn't come exactly on time and when I got to the Best Buy it was even more sketchy. Apparently they did have stock the young woman told me, but I had to make a request for any games, and they would retrieve them at the back ( I guess they were curbing hoarders). So I did, and some dude eventually came out with the game. She price matched it to beat Future Shop's $10 down to $7. But it wasn't without hesitation. I heard her ask the cashier if she wanted her to call the Future Shop to see if they had stock. If she did in fact call them, and FS told her they had stock, I would have been fucked out of the deal. And FS probably would have told them they had it "in stock" because I checked websites and their stores did list them as having it "in stock". But when I went to the 2 FS's that afternoon, none of them actually had them even though their records say they do. In the end, it was worth it though. I got home at 2:57, 3 minutes to spare! And I got the game for $7. Some of McDonald's combos cost more than that. On a final note, on the Friday of the sale, EB Games was offering $15 in trade-in-value for those games mentioned before (profiting you $8 to $10). However, word on RFD was that they blacklisted some customers because they were exploiting the system. Saturday hits, and a memo is sent throughout EB to lower the TIVs to $7, thus kiboshing those hoarders (no profit for you fuckers!). I don't like EB, but good for you! Anyhow, Dead Space! Are you still interested? I'll keep it short then! I mentioned in my review of Drag Me to Hell that jump scares don't get me anymore, that I was desensitized to them. Well, as I have recently discovered, the aforementioned holds true for movies, but in video games, it's a whole different ball game. There's many jump scares in this game and they all had me screaming, swearing, and otherwise, jumping. I think it gets me because I feel fully immersed into the game that when things happen to the main character, I feel as though it were me. Otherwise I don't know. I mean, the game used all the same tricks that movies do, yet movies don't get me. In Dead Space you play as an engineer (!) named Issac Clarke, who with a small crew, are investigating a vessel called the USG Ishimura who had sent out a distress signal. Issac and co. soon find that the ship is void of any crew but is full of undead creatures called Necromorphs. What at first seems like a rescue mission quickly becomes an escape mission, with all sorts of twists along the way. 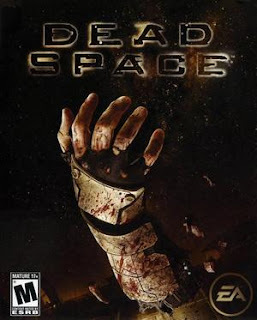 Dead Space plays as a third person shooter, with an over the shoulder style approach. Because you play as an engineer, instead of being armed with regular guns and explosives, your relegated to futuristic mining equipment like plasma cutters, saws, and the like, but aside from their names, they all pretty much are guns. The gameplay is relatively linear, requiring you to solve simple puzzles before moving forward. If at anytime during the game you find yourself lost, all you have to do is give your right analog stick a click, and your suit will project a beam showing you which direction you need to go next. As you're playing the game, you can't help but notice that the game incorporates elements from famous sci-fi horror movies (eg. Aliens, The Thing, Event Horizon, etc). From the designs of the corridors and rooms, to the aliens, and even to the story, EA Games did a great job of incorporating all these modern classic horror ideas. The best aspect of this game is the atmosphere. Specifically the sound design. It's done so well that it keeps you on the edge of your seat. Throughout the game you'll hear tons of background noises. Often you can hear aliens growling or dragging their bodies across the floor, but you never see them. It keeps the suspense level on high as you never know if they'll pop out of a wall or not. It also helps if you play this game with 5.1 surround sound. One of the cooler sound designs is whenever you go into outer space or any area with no air. Because you're in space, everything sounds muted and all you can really hear is your own breathing and gasping. It makes it all the more freaky when an alien lunges at you in these moments... you never hear them coming. Another cool aspect is that instead of having a HUD, everything you need to know is integrated into the game. Your life bar is on the spine of your space suit, your ammo is shown atop of your weapons, and any menus are displayed as 3D projections in front of you produced by your suit. This was quite a great design and made the gameplay seem seamless, never taking you out of the experience. The game was relatively short and easy, clocking in 13 hours at completion on the middle difficulty setting. It would have been shorter had I been not so cautious about all the jump scares. You're given a run button, but I hardly used it, in fear that a necromorph would pop out in front of my path. This was a fun game, and worth more than the $7 I paid for it. If you love the survival horror genre, there's no reason not to pick this up and give'er a try. Until next time, later geeks! That is a great deal, $7 for this game. Dead Space really surprised me, i didn't think i was gonna like it but ended up loving it. Sure it borrows elements from a few different sources (Alien, Doom, Half Life, Event Horizon and even John Carpenter’s The Thing) but it turned out to be a fun experience. I liked the zero gravity areas of gameplay and the outstanding audio is absolutely chilling. "Chilling", that is a great word that sums up my experience. Woah. That's a pretty intense shopping experience. Do you think the time spent justified the savings?